Pedigree Dentastix ® Large is rated 4.8 out of 5 by 121. Rated 4 out of 5 by Jessica13 from Chihuahua loves it! The first thing I noticed when I opened dentistix was the smell, it's quite clinical like an actual dentist surgery. As I have 2 smaller dogs, a Bichon and a Chihuahua, I cut the stick in half to share it equally. My Bichon stashed hers away for later, I know her well enough to go back to it later. My Chihuahua has been chewing and playing with hers since we got it and I can see where it rubs along her teeth, her teeth also sink into the stick so I can see how this will clean her teeth as she chews. I'm interested to see if this makes a different to their breath but I imagine only time will tell with more use. Nice hygiene product that my dogs see as a 'treat'. Rated 5 out of 5 by Clare75 from Good product I gave Barney one of the sticks, at first he seemed unsure & just smelt it, it was slightly bigger & felt harder in texture to our usual brand. He then finished it in no time & afterwards went to cupboard where we keep his treats & barked as if he wanted another, not something he usually does! Think we've been converted! Rated 4 out of 5 by Styx from Dentastix Got a sample of these in a free trial. We had a choice of 3 sizes, so I chose medium, as I have a border collie & a jack russell. The collie wolfed the chew faster than I expected...I thought perhaps it was going to be tougher to give them a "real" dental workout? That said, the JRT took longer, but got there eventually with his. It's definitely worth making sure you get the correct size of chew for your dog, as a smaller dog would struggle. (chews do come in S/M/L, but we were only allowed to choose one size for the trial). Rated 5 out of 5 by Marcus from My dog's favourite treat. I started my Cocker Spaniel off on these daily as a puppy & they have been his favourite treat ever since: 10 years now. To the point where he knows the word "Dentastix" & gets upset if I dare to run out of them. As to the claim about looking after their teeth; I don't know how accurate it is, but with his daily treat & having him on a diet of wet & dry food, he's reached 10 with only one tooth lost & very little plaque etc. 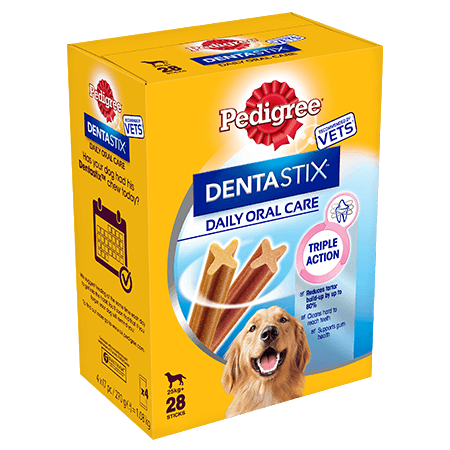 Rated 5 out of 5 by LindsayB78 from Perfect healthy treat Having purchased many different dental sticks for my dog, I recently purchased a pack of these. I didn’t realise how different some brands were. The quality of these were so much better, they were a longer stick, not crumbly like some I’ve bought, and as for flavour, well they’re definitely a hit with my Labrador. I won’t be going back to any of the others again, these are now a firm favourite. Rated 5 out of 5 by soniaevergreen from Dog really seemed to enjoy My dog was interested in this from the moment he heard the package. When I gave it to him he was off to his bed with it and that's where he stayed until every last piece was gone. What I found great about this product (other than the dogs enjoyment )was that there was no mess or crumbs off this dog treat so where he had ate it I wouldn't have needed to get a hoover out or clean up after him. Rated 5 out of 5 by IndianPatio from GREAT I had tried the medium size Dentastix for my medium sized dog but he ate each one so quickly it couldn't possibly have done much to clean his teeth. The large size however are much better. Each one lasts a reasonable time. People comment on how clean my dogs teeth are. I don't rely on Dentistix alone but I'm sure they make a large contribution to the overall condition of his teeth. Rated 5 out of 5 by Julie28 from Daily Treat my dog has to have we started giving one of these as a daily treat to our springer spaniel since he was about 9 months old at 8pm every night. He is now 5 years old and he associates the theme tune to different soap operas ending Corresponding to when he gets his treat and gives a high five when he gets it. It's the only thing we know he will eat even if he is off his normal food, he loves them. Large dogs, e.g. Labrador, feed 1 stick per day. This is a chewy treat that is not suitable for dogs under 25 kg or for young puppies under 4 months.